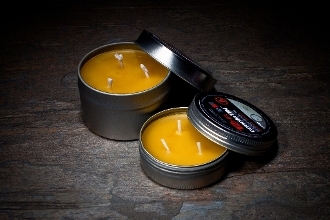 The candleTIN™ series offers the most versatile natural wax candle on the market. With three wicks in each candle, two different wick burn rates, and two tin sizes, these candles can be a source of light or a powerhouse of heat. The hot-burn candle can even be used to boil water in a pinch. The slow burn wick offers the longest burn time. Pair the slow burn wick with the large candle for a 30Hr continous burn candle.